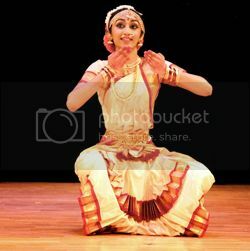 Sahita Manda from Abhinaya School of Dance performed her Bharatanatyam Arangetram on May 11th to a packed audience. A student of Mrs. Dhanya Vani Rao, Sahita’s hard work and perseverance paid off with a spell binding performance. She performed 12 dances, each increasing in level of difficulty, and each performed to perfection. She opened the ceremony with a traditional Pushpanjali, a dance welcoming the audience and thanking the Gods, Guru, and the audience for their blessings and support. Sahita followed this with Ananda Narthana Ganaptim, Alaripu, and Jatiswaram. In Shabdam, we saw Sahita as little Krishna stealing butter, teasing the gopikas, and playing magic on his flute. Varnam saw Sahita as the nayika of the story, asking her beloved why he is upset with her. The second half of the show saw Sahita in much more matured roles through 6 dances. The highlight was her dance on Durga, the Goddess of Shakti. The striking lighting effects enhanced the dance, and blew the audience away. The beautiful movements, subtle ways of showing the same emotion in various different ways, and the quick change in facial expression from happy to sad, proud to arrogant, and to shy and coy, every sentiment was superbly handled. Sahita flowed through each dance with smooth movements, perfect rhythm, beat, and posture. She brought life into even simple walking steps (called nadai), and she kept her audience captivated. 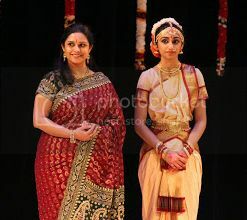 Sahita ended the performance with Kadanakuthuhala Thillana, followed by the traditional curtain call, Mangala charanam. Sahita’s parents Mrs Himaja and Mr Prasad Manda paid tribute to the teacher, Mrs Dhanya Vani Rao. Dhanya commented on Sahita's performance, saying ‘With hard work, determination, strength of family, and critiquing and blessings of teachers, anything is possible! Sahita is truly my unexpected success story.’ Congratulations Sahita!